No More Metal! : The Superiority of CAD-CAM Restorations - Gary M. Verigin, DDS, inc. Gary M. Verigin, DDS, inc.
A quick quiz: Have any of these teeth been repaired with dental restorations? Okay, that was too easy. But how about these teeth? They’re the same teeth, only now they’ve been fitted with an all-ceramic inlay and onlay. The process of creating these superior restorations begins in our office and is completed by the fine technicians and artisans of Creative Arts Dental Laboratory in Sacramento. We have relied on this lab for years due to the consistently high quality of work and the fact that all restorations are made on site. Unlike an increasing number of labs, they never outsource their work. This not only lowers the cost. If questions or problems should arise, we can talk with them directly to resolve the situation. We pride ourselves on providing Creative Arts with flawless impressions of the teeth to be restored. 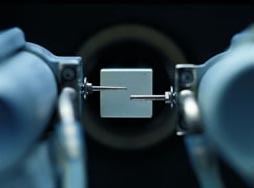 At the lab, they fill them with stone to create what is called the working model. The better the working model, the better the shape and fit of the restoration. 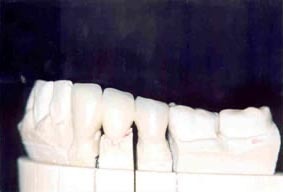 Once the model is prepared, the teeth to be restored are mounted within a machine called inLab. Here, the model is laser-scanned so that all of the angles and finish lines can be mapped on a computer. It’s a bit like a copy machine reproducing a document: the match is exact. A three-dimensional image of the scanned area is displayed on a nearby computer. 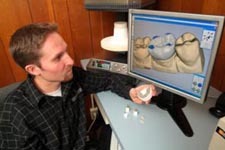 Studying the design I have carefully crafted – one in which as much of the natural tooth is saved as possible, which CAD-CAM makes easier to do – the technician graphically designs the restoration on the screen. Once satisfied with all elements – contour, shape, contacts and so on – the technician mounts a properly shaded block of material into the inLab machine, where small, computer-guided burrs mill the block according to the design. Although inLab is suited for a wide array of dental materials, most of the crowns and bridges we place are made with inVizion Zirconia YZ, which we like for its excellent versatility, strength and biocompatibility. It is the strongest dental material made and is nearly as durable as enamel. It also contains no metal. This is both healthier for your body and ensures that the aesthetics of the restoration will hold up over time. 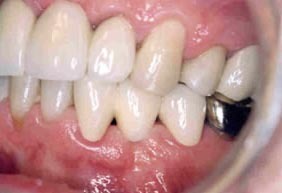 With these restorations, if your gums recede, you will never have the problem of exposed metal margins. The coping, or core, is slightly oversized after milling to compensate for shrinkage during oven-firing. It’s then seated and stacked with porcelain on theocclusal, or biting side, surface. Occlusion, or how the teeth come together, is tested by mounting the restoration on a semi-adjustable instrument called an articulator. This three-dimensional model mirrors the relation between your dental arches, their alignment and the very important tempromandibular joint. By this point, the shading of the restoration has already been matched to that of your adjacent teeth. When we send your impressions to the lab, we also provide digital photos that the technicians work with using ClearMatch software to create the perfect shade. With so many variables to account for, this technology simplifies the shading process immensely. The proper shade is chosen at the time of milling and perfected during stacking. This matching is crucial because we don’t allow the restorations to be “stained,” as staining agents may contain mercury, cadmium and other toxic metals. Once the restoration has been glazed and polished, it’s sent back to our office for placement and adjustment in your mouth. 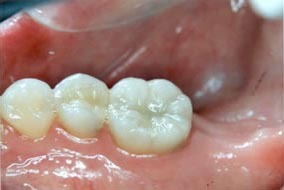 The process for creating inlays and onlays – restorations to be fitted into your teeth – is in many respects the same. However, these restorations are fully milled blocks (also known as full-contour restorations). There is no coping on which porcelain must be stacked. Made with inLab, the restoration is milled of-a-piece from either ProCAD or Mark II materials. 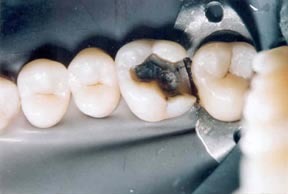 The occlusion is part of the milling process, though adjustments may be later made by a grinding technician before glazing and polishing. Before: The original restoration will be replaced with CAD-CAM inLab-milled ProCAD. During: Prepared teeth. 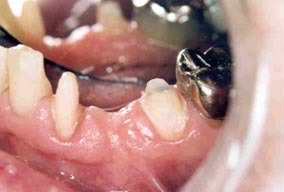 The dark areas are the dentin that has been stained by mercury corroding into the dentinal tubules from previously placed amalgams. 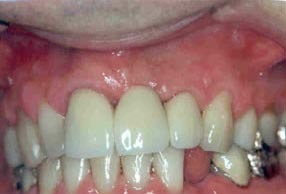 Before: This patient was missing a lower left first bicuspid and wearing a removable partial. Note the space. 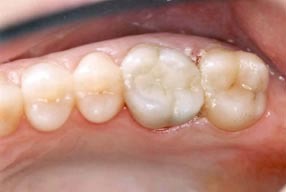 Bridge preparation: The enamel and some dentin have been removed from the teeth. Before we place the bridge, the teeth will cleansed with peroxide, medicated with homeopathic isodes and treated with a laser. These procedures enhance healing and repair of the dentinal pulpal complex prior to our bonding the bridge with composite cement. Inside view of the three-unit fixed bridge made with CAD-CAM technology, placed on the working model. Cheek-side view of the bridge, placed on the working model. Underside view of the bridge. 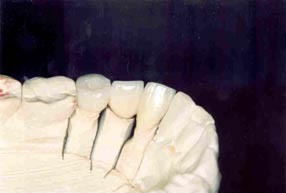 The outer teeth are called abutment connectors and will fit on top of the tooth preparations seen above. After: The bridge has just been bonded. The gums will continue to heal now that a nicely contoured and fitted bridge is in place. Because restorations are placed up to three weeks after the teeth have been prepared, we sometimes need to make adjustments at the time of cementation. With CAD-CAM restorations, these can be made with the highest accuracy. Because the restorations have been adjusted on an articulator, there is a better biting surface to work with. The biting pressures from opposing teeth are in much better harmony and alignment – oftentimes even better than the client had previously! The restorations blend perfectly with the shade of adjacent teeth. They are nearly invisible, even when viewed through magnifying lenses. Moreover, the surfaces feel just like those of your tooth before it got damaged. 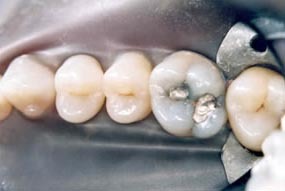 Biofilm also has a much harder time clinging to these restorations than to natural teeth, let alone toxic mercury fillings or direct composite resin fillings. Because the restorations are non-metallic, they do not create oral galvanic currents. 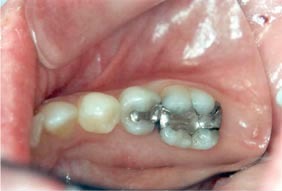 This is key because the greater variety of alloyed metals in your mouth (as many as 13 in some restorations! ), the more aberrant the currents may be. And the more aberrant the currents, the more vaporization of those metals will occur. When measured energetically, high currents from metal restorations can and do have an adverse effect on the energy package of the associated meridian. 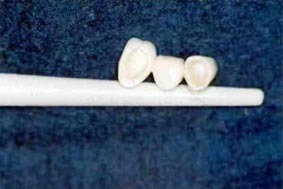 We have never had a patient fail biocompatibility testing for any of these all-ceramic restorations. This means the material is basically inert to both the client’s immune and energetic systems. Because composite cements and adhesive systems can be unpredictable in terms of immune and energetic effects, however, cement compatibility should also be tested. Dental ceramics manufacturers seemingly never sit back and let time go on without further research. And we can be sure that the lab we use will be right up-to-date as well. Thanks to them, we can provide you with the best possible restorations to fix damaged teeth, made with the most biologically inert dental materials ever introduced to the profession.